Listening tests of the 3R USB Renaissance focused primarily on comparing the performance of the Ideon Audio Ayazi DAC (which has been extensively reviewed (here) while streaming audio files through the USB port, with and without the device under test. In contrast to the lab evaluation process which had some limitations (explained on the relevant page), the listening sessions carried out with the system running at High Speed (HS) rate. The source was a computer running Windows 10 and the new Client/Server version of the MusiCHI media player, while the rest of the system was the standard used in all reviews (including the Melos Plus Series Line preamplifier, the Parasound HCA3500 power amp and the ATC SCM-50PSL loudspeakers). All cables used in the USB connections were of typically good quality and compatible with the USB 2.0/HS standard. Initial installation of the device, in practice, does not even exist as a procedure. As soon as the computer sees the DAC, the introduction of the 3R USB to the chain does not change anything, because it is a "transparent" USB device that does not require a driver or any settings. If everything goes well, the two LEDs on the front light up and the system is locked and ready for use. First impressions, after some experimenting, converge to that the differences introduced by the 3R USB are not very large or easily perceived. Ayazi's performance, with and without the conditioner, was not heavily altered (producing emotional "eureka" moments or anything), a result which probably should be attributed both on the computer and on the converter acting as a good system with low noise and jitter levels. For this reason, the trivial but quite realistic advice that such devices need to be tested in conjunction with the system in which they will operate applies. A number of systematic and rigorous listening tests, however, revealed that the device does, indeed, introduce some performance changes that can be considered both significant and sound quality improving (given the DAC's price level and quality). What one observes, first of all, is an improvement in some stereo imaging attributes. Ayazi is, no doubt, a great converter, but the inclusion of the 3R USB seemed to enhance its transparency and clarity, offering a better focus for individual sound objects, a better sense of scene depth and a better feeling of air. These changes become clearer with high-resolution files, probably partly because they contain more information and partly because the effect of the conditioner on higher bitrates becomes more important (based on the logic described on the lab evaluation page). Whatever the cause, however, the listener is facing a soundstage that focuses just behind the horizontal axis of the loudspeakers and sounds more realistic and full, being a more detailed description of the mix. Small but tangible changes were also detected in the timbre reproduction. The magnitude of these changes was not large enough to alter the tonal balance of the Ayazi, which would be undesirable, given its neutral and transparent character. Nevertheless, with the 3R USB in place, the DAC retained its very good low-frequency behavior, but improved somewhat on detail description and feeling of control, and sounded more impressive. The performance of the 3R USB/Ayazi combination in the high-frequency region was, also, quite interesting. While the good feeling of speed was maintained, percussion passages appeared better bodied and there was the impression that the system gained in softness, air, and balance. Ayazi retained its warm but slightly dark character and never became too bright or aggressive. 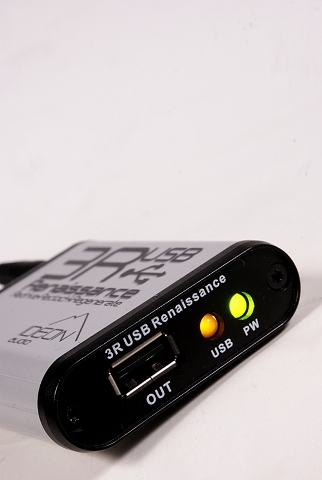 To summarize, the introduction of the 3R USB appeared to have a benign but perceptible effect on the audio performance of this particular DAC. By comparison, the system gained in stereo imaging accuracy, showed better clarity towards the very low/low-frequency part of the audio spectrum and improved in softness, feeling of air and balance in the high-frequency region, while retaining its overall character and tonal balance. With absolute criteria, 3R USB appeared to only positively influence the end result, significantly improving the overall performance. 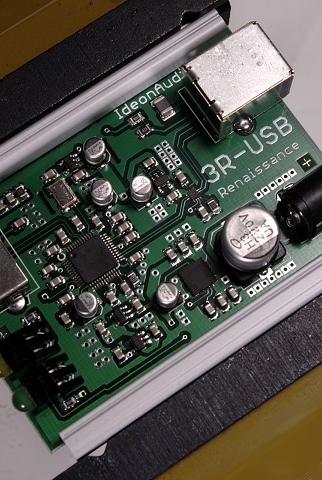 Residing in an area outside the traditional boundaries of high fidelity, where technology (and the market) are far from being mature and well-established, Ideon's 3R USB seems to make an interesting intervention, addressing, in a pragmatic way, the potential flaws of the USB transmission line, therefore maximizing the DAC potential. Is it worth of the €200,- price tag? All indications converge towards a resounding "yes". 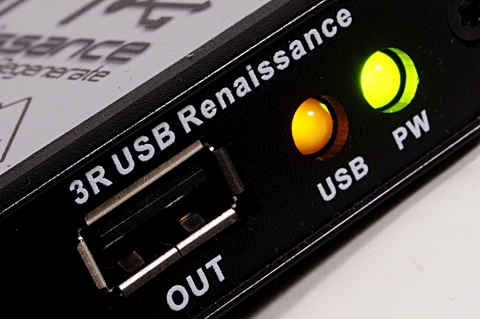 The 3R USB is something any audiophile should definitely try out in its own file-streaming audio setup. Highly recommended! Track #01 Ideon Audio Ayazi DAC+3R USB 44.1kHz. Track #02 Ideon Audio Ayazi DAC+3R USB, 96kHz. Track #03 Ideon Audio Ayazi DAC, 44.1kHz. Track #04 Ideon Audio Ayazi DAC, 96kHz. Track #05 Reference source (dCS Puccini u-Clock/Teac Esoteric D-70.